Washington state regulators will reevaluate marijuana edibles and could bar production of fruit chews, colorful chocolates and other candies. The announcement sent parts of the local cannabis industry into panic. 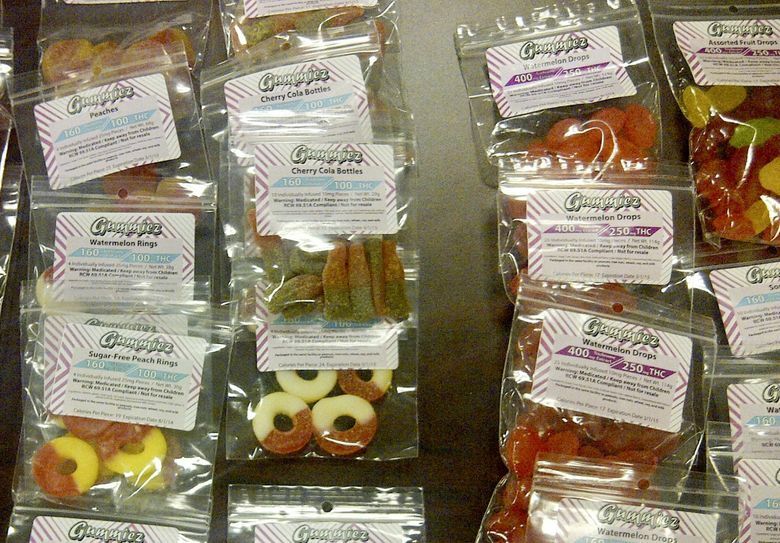 Certain cannabis-infused candies could start disappearing from store shelves across Washington early next year. The Washington State Liquor and Cannabis Board announced during a meeting Wednesday that it will “reevaluate” all edible marijuana products in an effort to cut back on products that may be appealing to children. Washington state, which legalized recreational pot in 2012, has long had rules barring products that are “especially appealing to children.” Even so, the board has received public complaints that some candies currently sold in the state’s pot shops could be enticing to kids, said spokesman Brian Smith in an email. When the board looked into the complaints, “they too had concerns,” Smith said. In response, the agency will now reevaluate all edible products and could strip approval from some candies already on store shelves. In a presentation posted online, the agency identified colorful gummy-style and hard candies as ripe for a regulatory crackdown. According to the presentation, “all production” of hard candies, tarts, fruit chews, colorful chocolates, jellies and “gummy type products should cease as they will not qualify.” Companies making such products can sell them until they run out or until April 3, whichever comes first, the presentation said. Edibles producers must resubmit their products to the agency by Jan. 1. Other products will be reviewed on a case-by-case basis. Drinks, baked goods and tinctures will continue to be allowed. Approval of chocolates, cookies, caramels and mints will depend on factors like frosting, sprinkles and whether they’re dipped in colorful coating. The legal pot industry has grappled with concerns about kids and edibles since its inception. Obama-era guidance in place the year after Washington legalized recreational marijuana said the federal government would allow state legalization to go ahead so long as officials took certain protections, including making sure the drug stayed out of kids’ hands. Last year, a Colorado law took effect banning any edible marijuana product shaped like an animal or person. Washington’s latest announcement has sent parts of the local cannabis industry into panic. Several edible makers and retail store owners told The Seattle Times on Thursday they did not receive advance warning that a potential change could be coming to the edibles market. Bob Ramstad, owner of Fremont cannabis store Oz, called it “shocking” that the agency could ban products it had previously approved. “Their interpretation of ‘exceedingly attractive to children’ is ridiculous,” Ramstad said. The candies at risk of being discontinued are a small fraction of the state’s cannabis market. Edibles make up 9 percent of the marijuana sold in Washington, according to the Liquor and Cannabis Board, and candies are just a fraction of all edibles. Yet for the companies that make them, they can be significant source of revenue. Diana Isaiou, owner of American Baked Co., said 60 percent of her edible company’s sales are fruit chews. Making candy can require expensive special equipment, and producers may have already purchased large amounts of ingredients and packaging materials for the upcoming year, Isaiou said. Jamie Hoffman’s edibles company, Craft Elixirs, markets a “candied artisan fruit chew” called Pioneer Squares. With five flavors currently on the market, including lemon-mandarin and pink lemonade, the chews combine a fruit-flavored base and candied piece fruit. Each square includes enough THC to get you “lightly lifted,” but not “super high,” Hoffman said. The chews grew quickly in popularity and now make up about 84 percent of her business, Hoffman said. Two months ago, the company got approval from the liquor board for a sixth flavor: blueberry. Now Hoffman is unsure if her product will fall under the state’s expanded definition of candies that appeal to children. Hoffman emailed back and forth with a Liquor and Cannabis Board representative Thursday, but said she was still unsure she should plan to take an 84-percent hit to her bottom line next year. “We’re hoping we’re not going to be collateral damage because of mistakes by others,” Hoffman said. The Liquor and Cannabis Board plans to hold a webinar on October 16 to address questions about its reevaluation of edibles. Companies whose products are rejected will have the chance to appeal.